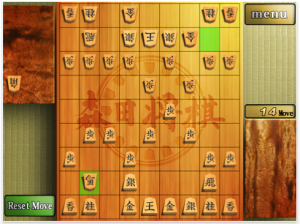 Taito and Square Enix on Friday announced the release of Morita Shogi HD, a $3.99 game for the iPad. It’s based on a previously released game for iPhone and iPod touch. Morita Shogi is, as the name implies, a shogi game. Shogi is sometimes called Japanese chess: two players square off on a board of rectangles, using a set of wedge-shaped pieces that include pawns, lances, knights, generals, bishops, rooks and kings. The game has been optimized for use on the iPad, with high quality graphics and multi-touch features. Morita Shogi HD uses the Morita Logic engine designed by World Computer Shogi Championship winner Kazurou Morita. The game features CPU play, tournament play against progressively more strong computer opponents, or head-to-head play between two players on a single device. Play histories are tracked, and pieces and backgrounds can be customized in 280 different combinations. You also receive medals for reaching in-game goals.